Tom Antunovich has joined the Newport Beach personal injury law firm of Bisnar Chase as the newest member of its successful team of trial attorneys. Antunovich is a graduate of Western State College of Law in Fullerton. 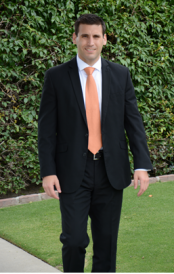 NEWPORT BEACH, Calif. - Jan. 27, 2016 - PRLog -- The Newport Beach personal injury law firm of Bisnar Chase has announced that Tom Antunovich is the newest member of its team of trial attorneys. As the newest member of Bisnar Chase's trial team, Antunovich will work with the firm's team of trial attorneys handling personal injury and product defect cases, representing injured clients and helping them seek compensation for their losses. A resident of Anaheim, Antunovich graduated with honors from the Western State College of Law in Fullerton in May 2015. He passed the California Bar Examination in July. Antunovich got his bachelor's degree in kinesiology from Cal Poly, Pomona, in 2010 and is a 2005 graduate of the prestigious Troy High School in Fullerton. In law school, Antunovich was also a member of the mock trial team. For a little over two years, during his time in law school, Antunovich was a clerk at Bisnar Chase, helping the trial team with case preparation. "It was a tremendous experience for me and it gave me something to work toward," he said. "I'm thrilled to get this opportunity to work with a team of dedicated and committed professionals. I know I'm going to learn a lot." Antunovich particularly worked with personal injury lawyer H. Gavin Long, who has won several verdicts and settlements for Bisnar Chase's clients over the last three years. Long said Antunovich has everything it takes to succeed as a personal injury trial lawyer. "Tom not only has the drive and the will to win, but he also has genuine compassion for clients, which is crucial if this is what you want to do for a living," Long said. "Personal injury law is truly a calling and I have no doubt in my mind that Tom has the head and the heart for it." Antunovich said he truly enjoys his work. "I really like the fact that I'm not working for large corporations, but the little guy who otherwise might not have access to the civil justice system," he said. "I like a client I can see, call and talk to, and I like that one-on-one interaction." For Antunovich, in the end, it's all about the crusade for justice. "The one thing that has really caught me by surprise is how hard insurance companies fight against people who are legitimately injured," he said. "A lot of the people who come to our law firm, their lives depend on how we handle these cases. The work I do means something. And that's truly a great feeling." Bisnar Chase represents seriously injured victims of car accidents and other acts of negligence. The firm has been featured on a number of popular media outlets including Newsweek, Fox, NBC, and ABC and is known for its passionate pursuit of results for their clients. Since 1978, Bisnar Chase has recovered hundreds of millions of dollars for victims and their families. For more information, please call 800-561-4887 or visit http://www.BestAttorney.com for a free consultation. We are located at 1301 Dove Street #120, Newport Beach, CA 92660.